I’m a little behind on the blog these days, please forgive my absence from the interwebs. Over the past week we managed to move our two orange pets and our densely populated home into a 12-foot truck, across 12 states and into a spare bedroom, where we reside until we find a house to buy (our first home!). We’ve returned to our pretty city, Austin, Texas, after two years soaking in Brooklyn’s charms. Along the way here, we were treated with such wonderful hospitality, my mom in North Carolina, our friend Lorna’s mom, Anne, in Birmingham, and our family friends, Clegg and Andrea, in Franklin, Louisiana. It turns out that moving (on a tight budget) takes a village, not unlike most things house and home. I’m way overdue on posting this recipe. I’d hoped to post this before Thanksgiving. MEH. No blog guilt here. Just cookies. chewy with a hint of crunchI don’t buy gluten-free cookies anymore because a) they’re expensive, and b) I know that when I bite into it, there’s going to be massive disappointment. Either they’re going to be excessively bean-y (I’m not keen on bean flours) or they’re going to be dry and blocky and utterly uninteresting. When I pulled these out of the oven last week a couple weeks ago, my cookie fast came to a delicious end. They’re perfectly chewy with a subtle crunch on the bottoms. The trick to these is not overcooking them. p.s. Cookies are a great idea for those of us with holiday travel on our agendas. No need to check a bag in order to smuggle home-preserved treats nor do you need to worry about your pie filling tipping out onto your lap on the bus (speaking from experience here). This recipe involves some equipment, but surely you could do it sans the fancy stuff. I happen to have a stand mixer and a silpat baking mat, so I used them. Roll up your sleeves if you don’t have a mixer and grease your cookie sheet really well if you don’t have the baking mat. until sugar and butter are completely incorporated. 4. Add 2 eggs, one at a time and then 1 tsp vanilla extract. 5. Slowly incorporate dry mix into the wet mix (in mixer). 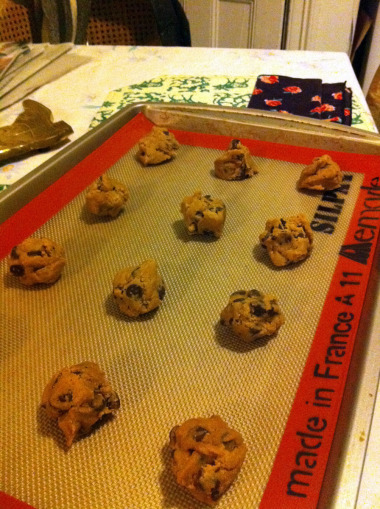 Add 1 bag (12oz) semi-sweet chocolate chips once the flour is completely incorporated. 6. 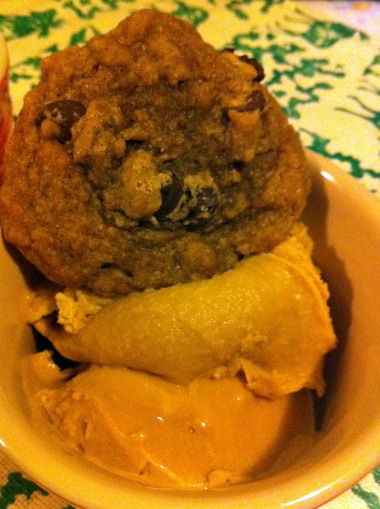 Depending on how many cookies you want all at once, divide cookie dough amongst four airtight containers and place it in the fridge overnight (or for as long as you can stand). You can freeze as much as you’d like. If I recall correctly, one fourth of the dough makes about 12 cookies. I remember having a gigantic bowl of cookie dough for a long time. It keeps in the fridge for about a week; freeze if you anticipate spacing out your bakings. When you’re ready to bake, preheat the oven to 350 degrees F and position the rack to the lowest place in the oven it’ll go. 7. Let cookie dough sit out on the counter for up to an hour (the batter will probably still be rock hard, but it softens as you use your hands to roll the dough) and then spoon and roll with your hands 1-Tbs-sized balls onto a silpat (or well-greased) cookie sheet. Space them about 3” apart, they spread. Bake for 7 minutes, rotate pan, and bake for 5 more minutes. They won’t seem done, but trust me here. Let them sit on the cookie sheet for 5 min and then use a metal spatula to swiftly scoop and relocate the cookies to a cooling rack. They firm up as they cool. This is what accounts for that soft, yet crunchy cookie. p.p.s. They go great with salted caramel ice cream.